Because windpower does not emit toxins into the air and its source of energy is recurrent, it offers the promise of a clean, renewable alternative to fossil fuels, along with the significant environmental problems they generate. Renewable energy has a long contrapuntal history, of course. A few hundred years ago, timber seemed inexhaustible, but our demand made short work of the supply for energy production. Coal, too, is renewable, but again, our demand will at some time overrun supply—and our meager lifespans won't extend the tens of millions of years necessary to replenish it. A few generations ago, hydroelectric dams were all the rage. While these do produce a lot of electricity from a renewable source, they are so environmentally damaging that many are now being dismantled, at taxpayer expense. Into this breach comes windpower—if it can produce enough electricity and if it is, on the whole, environmentally benign. Herein lies the problem, weighing costs against benefits. If the wind industry is successful with its campaign in the uplands of the eastern US, thousands of mammoth wind turbines, each over forty-stories tall, will soon loom for hundreds, even thousands of miles atop the most beautiful and environmentally important ridges of the East, visible for scores of miles, imposing high risk to millions of birds and bats which will have to run this gauntlet twice annually. These ridges typically form the backbone for numerous large and unbroken patches of forest—which are the last "best" places to maintain ecologically significant tracts of scarce, very valuable forest interior habitat. For each huge wind turbine recently erected on Eastern forested ridgetops, more than four acres of forest were bulldozed. But the impact on forest-interior habitat was much greater: the deleterious "edge-effects" from each turbine clearing and consequent access roads actually contribute to an average loss of nearly fifteen acres of forest-interior habitat per turbine. At the same time, despite this intrusiveness, such windplants will contribute only a small and diminishing percentage of the region's total electricity needs because they will produce only "a piddling amount of electricity" relative to our demand. The rush to site industrial wind facilities in the East seems unnecessary, especially given that the development potential in the upper Midwest alone would dwarf the total output of all wind energy facilities ever likely to be built in the eastern United States. Nonetheless, there is a clamor for wind initiatives in the East, fueled by uninformed wishful thinking of well-intentioned advocates for clean, renewable energy, as well as by extraordinarily lucrative government-induced programs offering tax credits and other means to shelter income for wind investors—which are not indexed to any reductions in the mining or burning of fossil fuels. Windpower would not exist in its present industrial form without these "incentives." The relatively feckless energy produced is a front for the real business of generating tax avoidance schemes benefiting a few at the expense of many, while playing havoc with the environment while claiming to be saving it. The industry is in fact a spiritual descendant of Enron, the "energy" company that, before its demise, owned and operated the nation's largest collection of wind facilities; it pioneered the tax shelter as a commodity. In pursuit of a financial bonanza, the wind industry fiercely resists any federal or state regulation guiding windplant installation. To protect their investment potential, eliminate the perception of negative effects, and neutralize their critics, wind developers have unleashed a sophisticated public relations campaign permeated with false and misleading claims, appealing to those hoping for the benefits of a safer, more healthful alternative to the mining and burning of fossil fuels. This campaign has helped build a political alliance attractive to many politicians, who give the impression their bills will result in improved public policy (but really reinforce the comfort of the status quo, especially for the coal industry). The same politicians bestow government-sponsored financial incentives which wind investors seek. This cycle exemplifies much that is problematic about national and state policies, where corporate lobbyists influence lawmakers to gain financial reward at the expense of public well being. The zeal for maximal profit now too often overrides the quest for responsible citizenship. After the fact law suits brought because of predictable windplant nuisances are difficult, expensive, and time consuming. 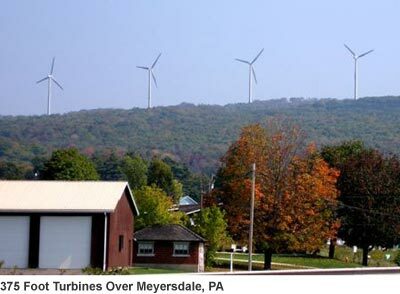 These massive windplants often precipitate incivility, pitting neighbor against neighbor. A major reason for government to exist is to mitigate—even anticipate—this incivility. The failure of many local governments to provide appropriate leadership on this issue is appalling. Regulatory agencies should not use the failures of local government to shun their responsibility to protect the public. To better understand the wind industry's public relations campaign and its implications for public policy, and to provide the public with better information about the industry itself, here is a list of the most frequent false and misleading claims the wind industry makes on its behalf, accompanied by an analysis of each.